When thinking of rooms that have cabinetry, you might think of a kitchen or bathroom. But in reality, cabinetry is great for any room in your home! Cabinets are like building blocks. You can play around with different shapes and sizes to create different functions in a space. Take a look today as we explore some of the many ways cabinetry can work for any room. Read more below! This custom designed cubby with three designated sections is great for any family, especially ones with children. Here we’ve designed a unit complete with tall storage cabinets on the ends and separate sections in the center. The open shelving allows for storage utilizing decorative baskets where you can store hats, shoes, gloves, and more. The horizontal wood shelf acts as a bench where you conveniently have a place to sit and get dressed. These cubbies are perfect for the busy family! 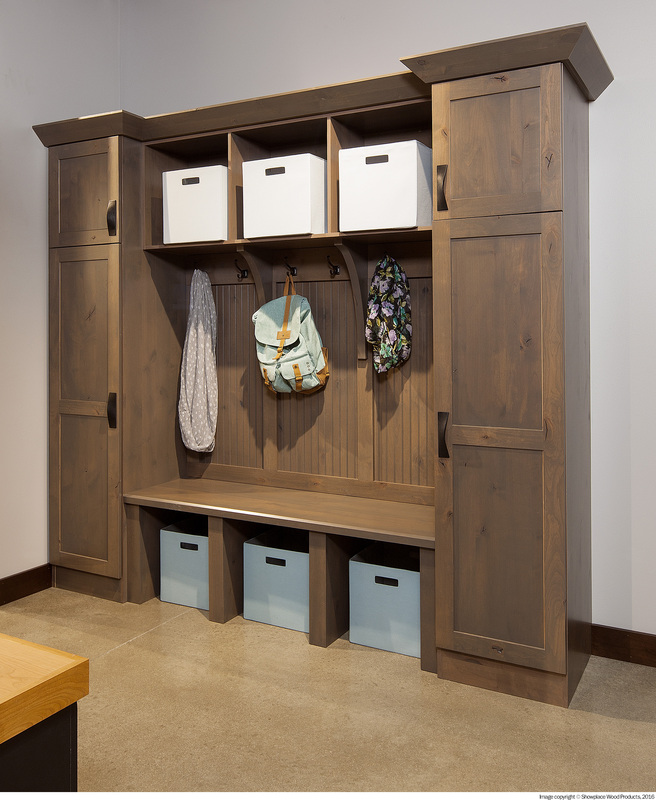 Cabintery cubbies are great for organizing your kid’s school and sports gear all in one spot! We all know the kitchen is the heart of the home, but the family room comes in as second. People love gathering around the TV to catch a favorite show or a big game – so the TV unit plays an important role. Here we have incorporated a tall cabinet unit to the left which stores DVDs, remotes, cords, and other tech items for the TV. Under the TV are low drawers topped with a wooden top. 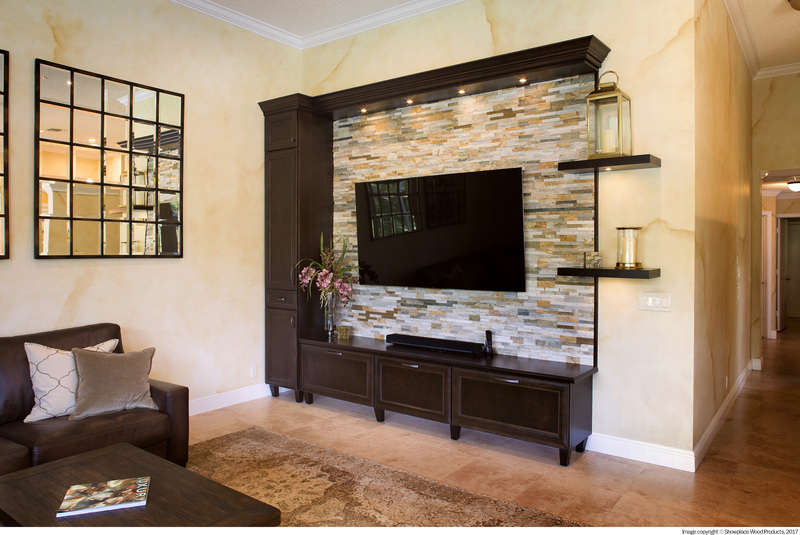 To the right of the TV we have floating shelves and above the TV is a horizontal panel complete with LED lighting to provide ambiance to the space. Plus, the exposed toe space gives a feeling of openness to the unit without it feeling bulky. When designing a TV unit, the options are endless. Think about combining tall with short and leaving a space in the center for a TV. People often contemplate converting their extra bedroom into a home office. Well, with the many ways you can build an office, there’s bound to be a solution for anyone! 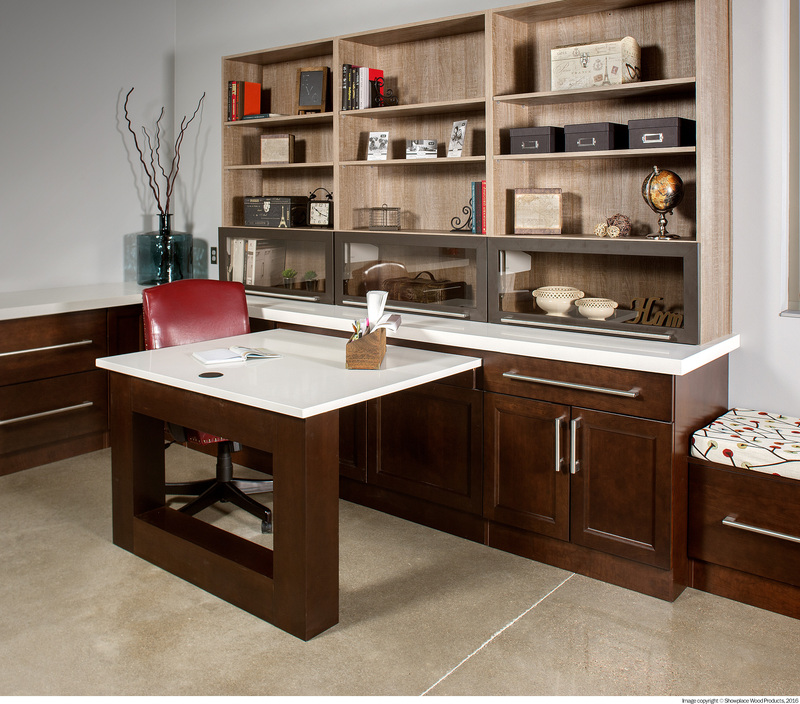 Here we have combined a mix of open and closed cabinetry, a desk, and lift up cabinets for display. Plus, we’ve combined two different cabinet finishes for added interest! Home offices don’t have to be a bore. Combining different finishes and textures can make mundane tasks, such as paperwork, a little more exciting! A walk-in closet is nothing without storage and organization. A good wardrobe cabinetry unit for your closet will have a variety of storage types such as a place to hang clothes and a place to stow away clothes. In addition to clothing, storage for shoes, purses, hats, and other accessories are a must. Here we’ve created individual sections by using panels and each section has a designated storage purpose. In addition to having great storage in your walk-in closet, good cabinetry lighting is just as important. Whether it’s natural light or ceiling light, it’s important to be able to see what you’re picking out to wear. All in all, cabinets are great for any room and if utilized resourcefully, you can create wonderful solutions for any space! Speak to our design team for more information as we have the knowledge and expertise to create and design spaces that work for you. Contact us here!